• Bradycrotic: from the Greek [krotos], meaning "pulse" "or pulsation" A bradycrotic agent slows down the patient's pulse or heart rate. The word [bregma] is Greek and means "the front of the head". It is actually the point of intersection of the the coronal and sagittal sutures. The coronal suture is the articulation or joint between the frontal and parietal bones, and the sagittal suture is the median joint between both parietal bones. The term was first used in anatomy as a craniometric point by Paul Broca (1824 - 1880). The image shows a superior view of two heads and the location of the coronal and sagittal sutures. The bregma is the point of intersection of these two articulations. 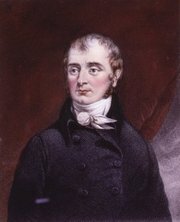 Marie-Francois Xavier Bichat (1771 - 1802). French physician, surgeon, anatomist and physiologist, Marie-Francois Xavier Bichat was born in the village of Thoirette. His father was a physician, influencing his early instruction and vocation. In Lyon he studied anatomy and surgery. At 28 years of age Bichat was appointed physician to the Hôtel (Hospital) Dieu. His life was influenced by his mentor, Pierre-Joseph Dassault (1738 - 1795). Upon his mentor's death Bichat took upon him to continue and finish his work, while supporting his mentor's family. Bichat is know for the concept of the body composed of distinct tissues, which he originally called "membranes". Without the aid of the microscope Bichat described 21 different tissues and is considered the founder of the science of histology. His name is preserved in many eponymic structures such as Bichat’s fossa (pterygopalatine fossa), Bichat’s buccal fat pad, Bichat’s foramen (cistern of the vena magna of Galen), Bichat’s ligament (lower fasciculus of the posterior sacroiliac ligament), and Bichat’s tunica intima (tunica intima vasorum). 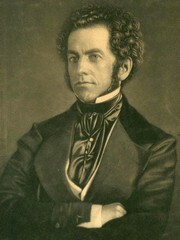 Xavier Bichat also contributed to a newer description of the humoral physiological theory, later becoming the basis of hematology. He was also interested in the description of life and death, proposing the existence of an "organic life" and an "animal life". An interesting note is that Bichat died because of an infection he acquired while dissecting a cadaver. Remember that at the time, no embalming was used! Today Bichat's name is almost forgotten, although in some countries the buccal fat pad is still called "Bichat's fat pad" In many Spanish-speaking countries this structure is referred to as "la bola grasa de Bichat", and many still refer to the removal of this fat pad as "Bichectomy". For an image of the before and after of the procedure, click here. 2. "Physiological Researches on Life and Death" Bichat, Marie-Francois Xavier, 1827. Translated from French by F. Gold. Richardson and Lord, Boston. This complex medical word is formed by the combination of two root terms: [dacry-] meaning "tear" and [-cyst-], meaning "sac". The combined root [dacryocyst-] means "tear sac" or better, "lacrimal sac" (the Latin word [lacrima] means "tear"). This medical word also has a combined suffix: [-(o)lith], meaning "stone", and [-iasis], meaning "disease or condition". The word [dacryocystolithiasis] means then, "a condition or pathology of stones (calculi) in the lacrimal sac". The procedure to remove the stones would then be called a [dacryocystolithectomy]. 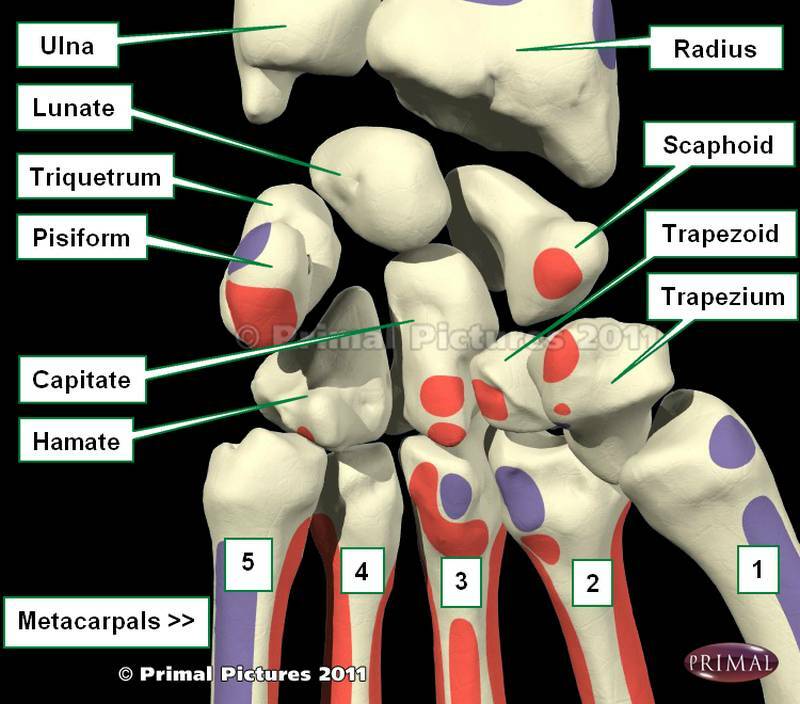 The Hamate bone is one of the four bones that comprise the distal row of the carpus or carpal bones that form the wrist. The name arises from the Latin [hamatus], meaning "hooked". The hamate bone has a distinct hook-like bony process in its volar (anterior) surface, known as the hamulus. This bone is also known as the "unciform bone" (from the Latin [uncus], also meaning "hook") or the os hamatum. The lunate bone has a wedge-like shape and six surfaces (as a die). It articulates with five bones, including the lunate bone, capitate, triquetrum, and the fourth and fifth metacarpal bones. The hook of the hamate bone is one of the distal boundaries of the carpal tunnel and serves as a pulley for the tendons of the fourth and fifth flexor tendons. It also serves as one of the points of muscular attachment for the following muscles: flexor carpi ulnaris, flexor digit minimi, and opponens digiti minimi. Because of its projection into the palm of the hand, the hamulus is involved in injuries in sports that require the athlete to use an accessory, as in racquetball, tennis, baseball, golf, etc. The accompanying image shows the anterior (volar) surface of the wrist. Click on the image for a larger picture. The word itself arises from the Greek. The root term [-phleb-] derives from [φλέβα] (phleba) meaning "vein", and the suffix [-otomy], meaning "to cut" or "to open". Let's not forget that the suffix component [-y] means "process of". So [phlebotomy] is the "process (or action) of cutting open a vein"
For centuries a standard practice in medicine was to "bleed" a patient, by opening a vein under controlled conditions and letting some blood flow. The practice was known as "bloodletting" or phlebotomy. Not in use today, it is said that excessive bloodletting contributed to the death of George Washington, having removed 5 pints of blood in one day!. Today the professionals who draw blood are called "phlebotomists"
The image (circa 1860) depicts one of the only known three photographs of a bloodletting procedure. Observe the lack of aseptic technique. Image by The Burns Archive, courtesy of Wikipedia.org.